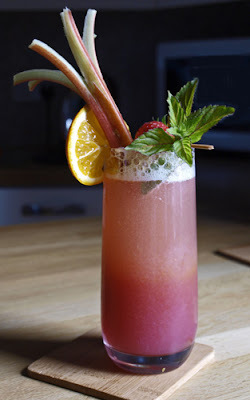 I thought about making the schnapps, but somehow it was the Homemade Rhubarb Syrup that appealed to me. The recipe is just sooooo easy: two cups sugar, two cups water, 6 or 7 stalks of rhubarb, washed trimmed and finely sliced. Check out the method, also extremely easy, at The Paupered Chef. I sterilised a jar and have been storing the glorious pink stuff in the fridge waiting for the weekend to come around again. 1. Cut the orange in half, squeeze one half and put the juice in the bottom of a tall glass. Cut a slice from the other half of the orange and make a cut into it so it will sit on the glass. 4. Top up with Crabbies AGB or, for a non-alcoholic cocktail, ordinary ginger beer. 5. 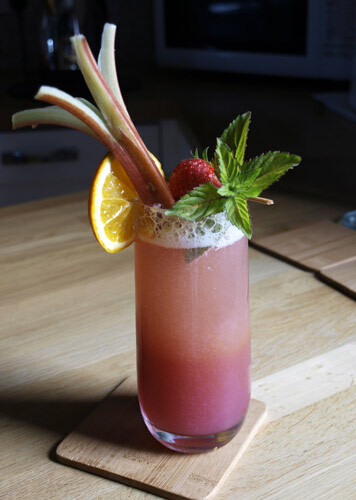 Remove the rhubarb stick from the water, dry with kitchen paper and place with the 'flower' upwards into the glass. 7. 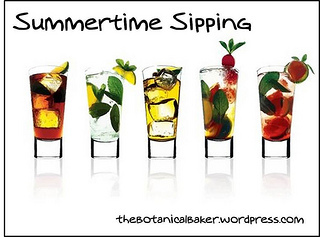 Add the slice of orange and enjoy. The rhubarb can be used to mix the ingredients before drinking, but it's fun to leave the layers of different ingredients showing when you serve. Cocktails always make me think of the 1920s, so I thought I would share this photo I found when I was visiting my mum recently. I would be about 19 and was part of a 'float' for the local festival parade. 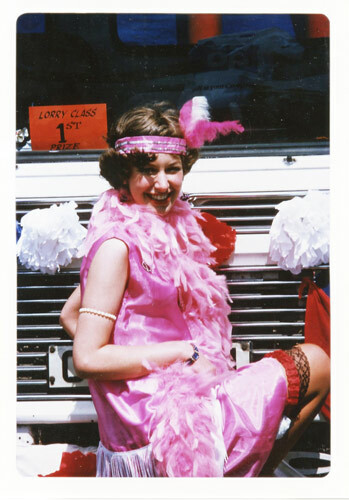 My mother was always roping me into these things and the costume was really fun to wear. CHEERS! The cake duly arrived in a nifty little box that fits through your letterbox. 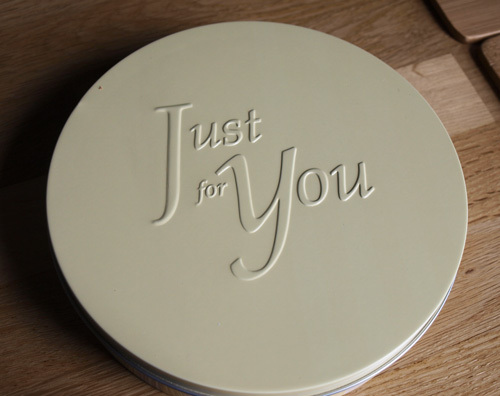 The packaging is excellent and the cake was in pristine condition. 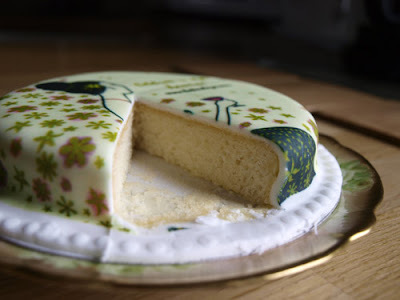 At first I was a bit disappointed by the size, but the cake cuts up into about 8 slices (they state it serves 4-5) and I can imagine that getting the cake as a surprise gift would be lovely, especially if you didn't have to go to the post office depot to collect it because..it fits through your letter box! 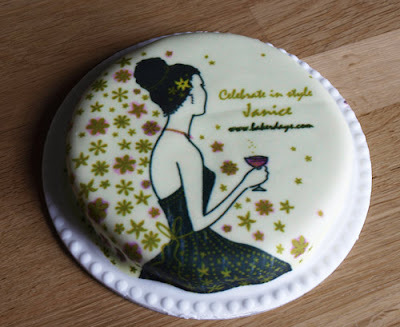 There are 300 different designs and 6 cake recipes to choose from, I chose a madeira cake with the 'Perfect Evening' from the Fashion and Glamour section of the Birthday designs. 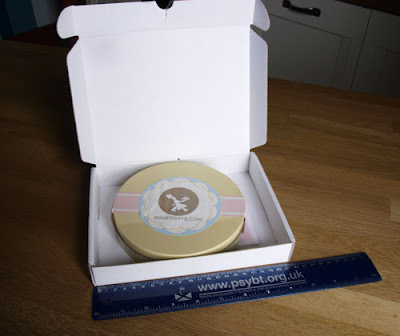 The Letterbox cake comes with it's own tin and the stickers come off really easily without any mess. Every cake also comes with a little party pack of candles, baloons, gift card and party horn. This is a dessert idea for Simple and in Season for June which is being hosted this month by Laura at How to Cook Good Food rather than as usual by Ren at Fabulicious Food. This is my second entry for June and simple is the operative word here. I had some strawberries left over from the strawberry tarts, I also had some creme pattiserie and some of the strawberry jam glaze. 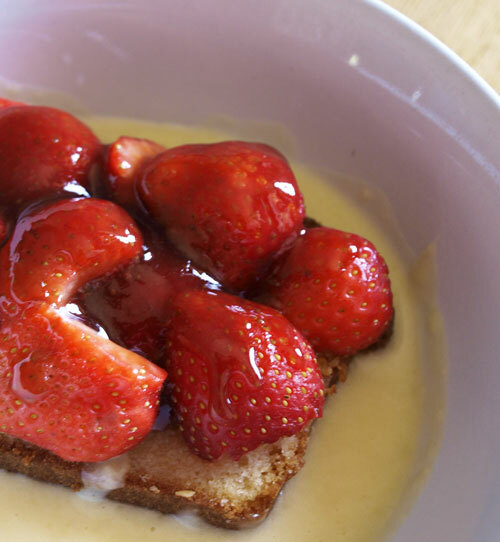 Rather than make more tarts, I took some slices of lemon drizzle cake from the freezer, drizzled over a little organge juice, spooned the creme pattisiere round the cake, piled on the strawberries and topped with the glaze. Like many simple ideas, it was excellent! I got a nice piece of brisket on special offer, it's not something I would normally cook in the summer, but we are not having much of a summer and it was pouring with rain yesterday and just the day for a nice slow cooked meal. I looked around to see if I could find some inspiration for a summer version of a pot roast and found this Summer Garden Beef Pot Roast at the 'Only Sometimes Clever' blog. I followed the recipe pretty much as is, although I used sweet smoked pimenton paprika and my basil isn't ready yet so I used some fresh thyme and rosemary. Oh, yes and rather than add water, I added 500ml of still cider which worked brilliantly giving the sauce a little sweetness. 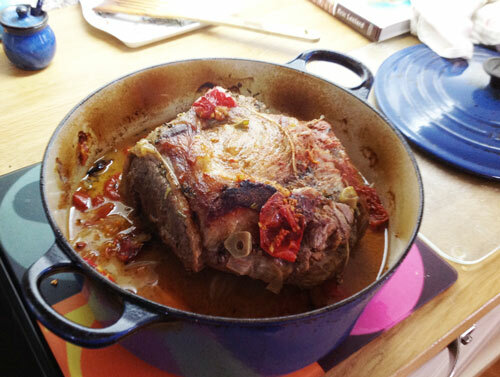 Of course, I don't have a 'crockpot' so I cooked my beef for about 4 hours, first hour at 160C and then turn it down to 140C for the next three. Keep taking it out every hour to hour and a half, poking at it to see how it's getting on because it will depend on the size of your beef and the amount of vegetables you have in there. 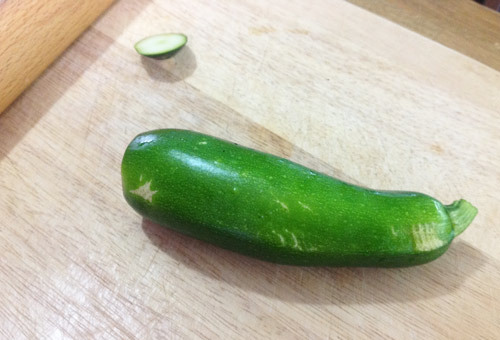 I used the first courgette (zucchini) of summer from my garden. I have two plants in a big planter and they have been loving the mild, wet weather we have been having. This is the roast after a couple of hours, the pot was full to the top with veggies when it went in but they had melted away, so there was then room to add the new potatoes cut into big chunks, skins still on. I used some gravy powder to thicken the juices, but you could serve them as they are or use a little cornflour mixed with water. 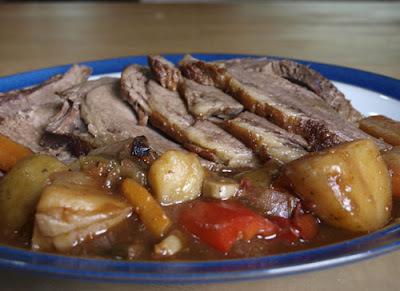 It's a great meal, the garlic permeates the gravy and the beef, the tomatoes and peppers add sweetness and the potatoes are there to mash into the gravy and get all the the juices mopped up. 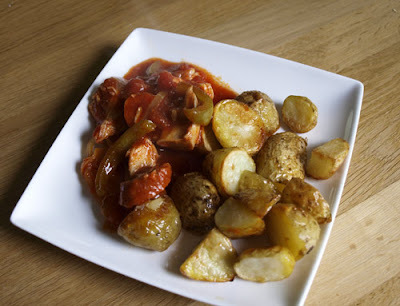 Everything in one pot also means less washing up! 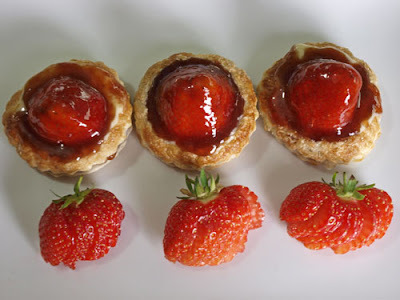 It may not look much like summer outside, but Strawberry Tarts are very much part of a British summer. When I saw that 'Summer Berries' was the theme for the June Tea Time Treats challenge run by Karen at Lavender and Lovage and Kate at What Kate Baked, I decided to have a go at making them myself. 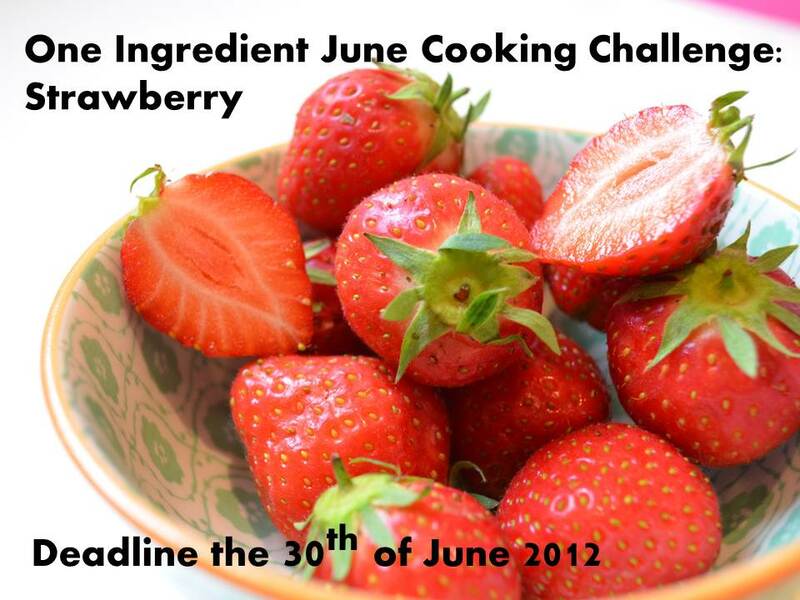 As a bonus, strawberries are the 'One Ingredient' for the One Ingredient challenge run by Laura, How to Cook Good Food and her co-host Nazima, Working London Mummy who is hosting this month. 2. Place the circles on a piece of baking parchment on a baking tray, brush with egg white and sprinkle with caster sugar. 3. Bake at 220C for about 10 minutes until risen and golden. Leave to cool. 4. Make the creme patisserie: Beat the egg yolks with the sugar until it becomes pale and fluffy, add the cornflour and mix thoroughly. 5. Heat the milk in a pan until nearly boiling, pour slowly over the egg mixture beating all the time, return the mixture to the pan and add the vanilla extract. 6. Heat gently until it comes to the boil, continue to cook for 2 minutes until it has thickened, add a knob of butter to add a little gloss to the sauce. 7. Pour into a bowl (if you have any lumps, you can sieve it into the bowl), cover with cling film and chill. 8. 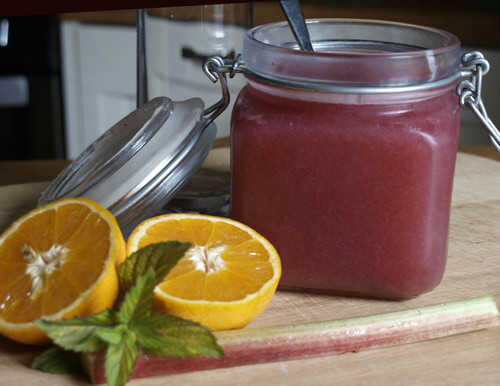 Sieve the jam to make a smooth glaze. 1. Carefully cut the centre circle out of the baked pastry circles and remove the centre of the shell. 2. 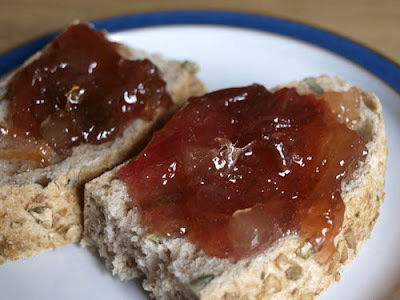 Put a teaspoon of jam in the bottom of each of the cases. 3. 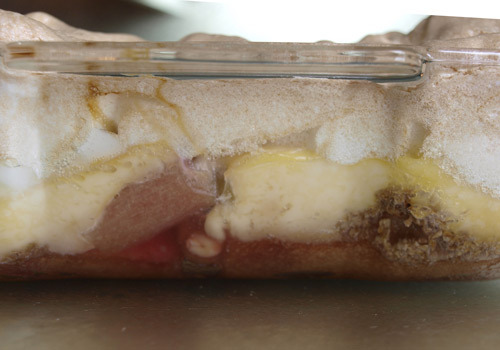 Add 3 tsp of creme patisserie into the case. 4. Place a large strawberry on top of the creme patisserie. 5. Spoon over more strawberry glaze. 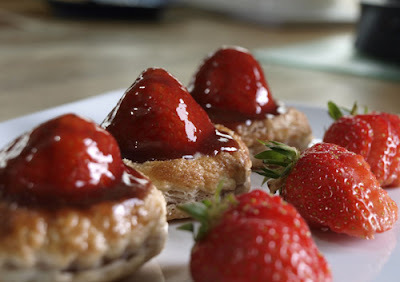 I know puff pastry isn't traditional for strawberry tarts, but it worked really well adding a lovely light, sweet crunch to the strawberry and creme patisserie. If you want an even easier way to make these tarts, buy some vol-au-vent cases, which is effectively what I made, use a high quality ready made chilled vanilla custard, you could knock these up in no time at all. It's rhubarb glut season here in Scotland, but although I now only have one rhubarb plant instead of three I still find it hard to use up all the rhubarb and the heavy rain we have had has just made it grow even more! 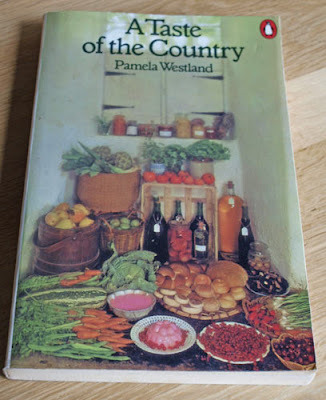 I may have featured this book before, it was one of the first cookbooks that really fired my imagination. I borrowed it from the library when I was 15 years old and carried it off to Belgium on holiday as my holiday reading. I then bought a copy and some of the first recipes I made were the rhubarb jams. This is the second copy of this book I've owned as the first one fell to bits. 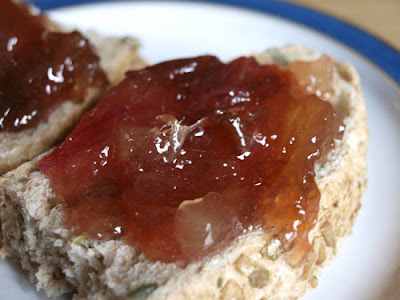 Rhubarb jam is really easy to make and the preserved ginger adds a fabulous kick. We don't eat a lot of jam now and this quantity will make about 4 standard jars. The book was first published in 1974 and I'm afraid the quantities are in imperial meaures (pounds and ounces) but I've found a nifty conversion chart here if you want to use metric measurements. 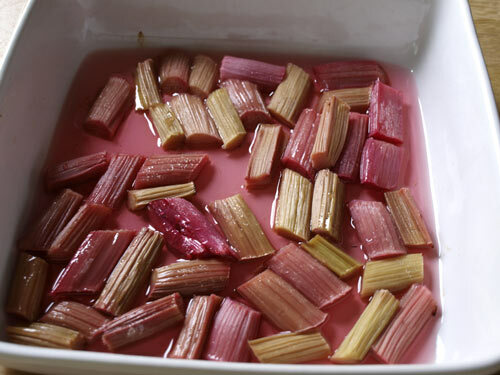 Wash and trim the rhubarb and cut into 2in sticks. Weigh the fruit. 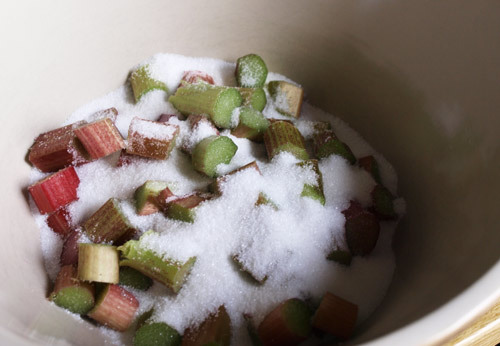 Put alternate layers of fruit and sugar in a bowl, cover and leave to stand overnight. 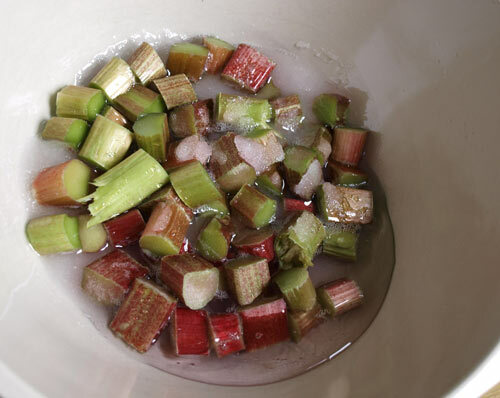 In the morning most of the sugar will have dissolved and the juices will have come out of the rhubarb. Turn into a pan, add the root ginger tied in a piece of muslin and bring slowly to the boil. Fast boil for 15 minutes. Remove the ginger and add the preserved ginger, boil for a further 5 minutes. By this time the rhubarb should be clear. Test for set. Pot and cover in the usual way. I had the urge to bake yesterday, I'd been clearing out and tidying up all my cake supplies and saw that there was half a bag of dates that could do to be used up. As always my thoughts drifted towards the various blog challenges that I like to join. 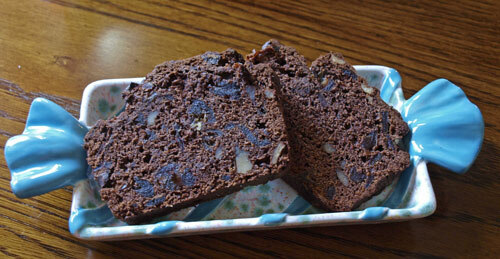 I flipped through an old Bero cookbook and saw a Date and Walnut Cake. But that wouldn't do for any challenge but if I added cocoa powder and some coffee...it would fit with this month's We Should Cocoa! And so the Chocca-Mocha Date and Walnut Loaf was born. 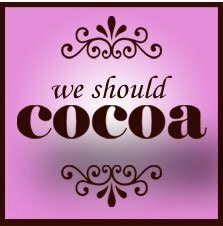 'We should Cocoa' is a challenge created by Choclette at Chocolate Log Blog and Chele at Chocolate Teapot, but this month is being guest hosted by Lucy at The Kitchenmaid. 3. Put the dates in a bowl, add the pinch of bicarbonate of soda. 5. Pour the coffee over the dates and bicarb. 6. Cream the butter and sugar, then gradually beat in the egg. 8. Place the mixture into the lined tin and spread evenly. 9. Bake for about 1 ¼ hours until firm. 10. Cool on a wire rack, serve sliced with or without butter. 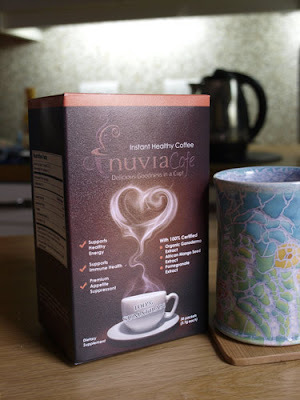 I used Nuvia Cafe as I had been asked to review it. 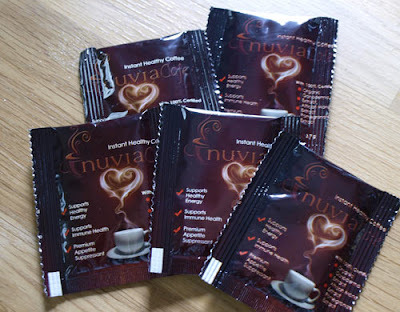 I must say I was a little sceptical, Nuvia is promoted as Healthy Coffee. It is Sumtran Arabica coffee infused with the extracts of 100% Certified Organic Ganoderma Extract (an immune enhancer), African Mango (a healthy, natural appretite suppressant) and Pomegranate (a super anti-oxidant) I did wonder what on earth it would taste like with all those fruity flavours. The coffee comes in nifty little sachets which are handy to keep in your bag or in a drawer at work. I was pleasantly surprised when I tried it, it looks like the old-fashioned powdered coffee or instant esspresso powder. It tastes more like filter coffee than it does like instant coffee, I like my coffee fairly strong, so it suited me. I expect if you used less than one sachet you could get a weaker cup. Whether it has health-giving properties, I would not like to say, but it is does make a decent cup of coffee and I had no qualms about using it in my baking. 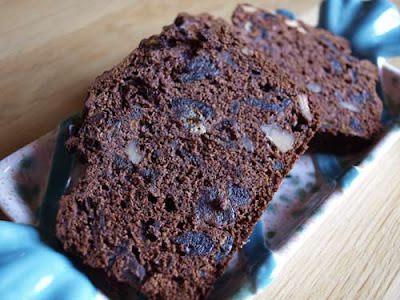 This recipe makes a really rich dark chocolately loaf, the dates provide a sweet moistness and the walnuts a nice crunch. I think it would go very well with a slice of crumbly wensleydale! After making the Iced Cranachan with Raspberry Coulis and Oat Crumble for Best of British, I was left with 3 egg whites, some Raspberry Coulis and a little Oat Crumble. So I decided that I would combine these with some rhubarb and custard and create a warm trifle. 1. 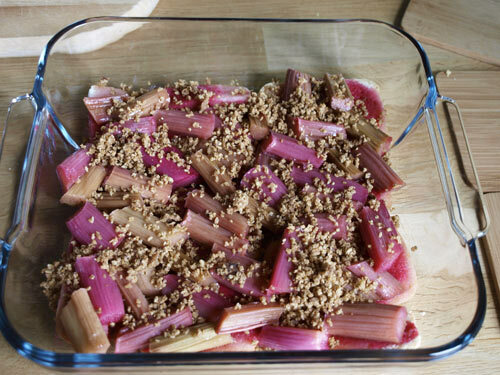 Cut the rhubarb into even sized pieces and place in a single layer in an ovenproof dish or baking tray, sprinkle with 1 tbsp caster sugar and roast at 200C for about 10-15 minutes until soft. 2. 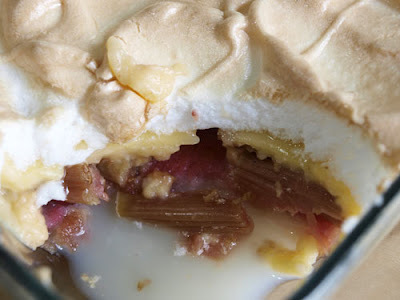 Place the trifle sponges in the base of an ovenproof dish, pour the raspberry coulis evenly over the trifle sponges and then cover them with the rhubarb and the juices that have gathered in the bottom of the dish. 3. Scatter over the remaining oat crumble (optional). 4. 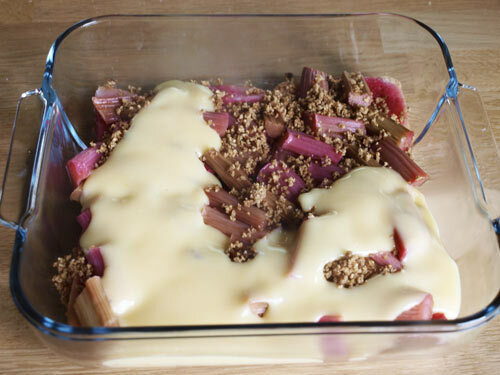 Make the custard according to the instructions on the packaging and pour over the rhubarb. 5. Whisk the egg whites until they are stiff, gradually whisk in the sugar until glossy. 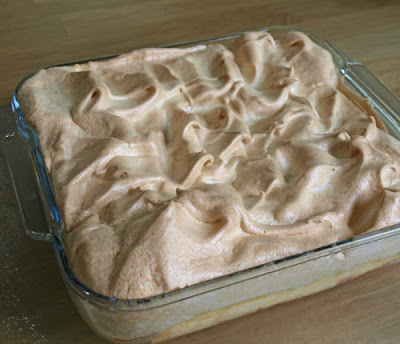 Pile the meringue on top of the custard and bake in the oven at 160C for 30 minutes, until golden brown. Serve warm with cream or creme fraiche. 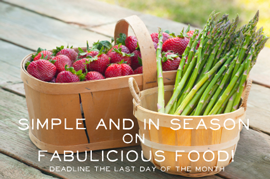 I'm entering this recipe for Simple and in Season, which is being hosted this month by How to Cook Good Food on behalf of Ren Behan at Fabulicious Food. On Friday, I posted a message on Twitter: I asked what I should do with the leftover Piri Piri Chicken. I had replies from The Glasgow Food Blog, Carl Legge and Edible Things suggesting wraps and risotto, but none of these was really speaking to me. An onion, a green pepper, a chorizo sausage (hurrah) some reduced price jersey royals and half a bag of coriander. I was immediately reminded of Dom's latest chicken thigh recipe, Chicken Thigh Creole Gumbo at Belleau Kitchen. 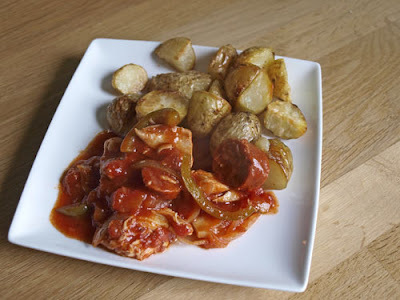 So this is a sort of homage to the Chicken Gumbo, but with more of a leaning towards Spain than to the Southern States of the US! Many thanks to all who suggested ideas for my left overs, it's nice to know that people will respond to a request. 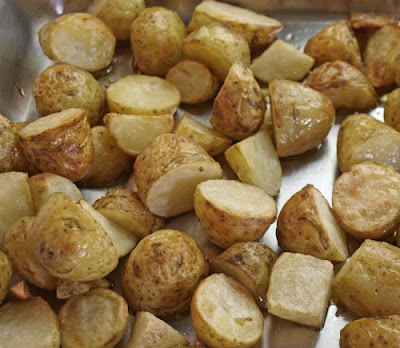 Roast the potatoes: half and quarter the potatoes so they are all a similar size. Cook for 5 minutes in boiling water then drain. Heat the oil in a roasting tin at 200C, add the potatoes and roast for about 30 minutes until golden and crispy. Serve the sauce over the roasted potatoes and sprinkle over the chopped coriander ( I forgot to add it for the photo!) I have to say that this dish was probably better than the original Piri Piri Chicken and lovely and warming on a cold and damp June day! 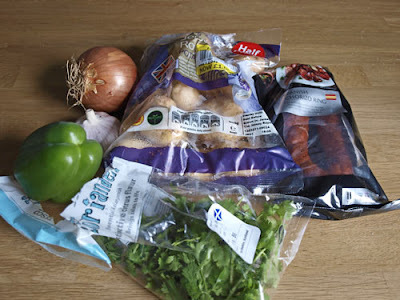 I'm entering this for the No Waste Food Challenge at Turquoise Lemons blog. Best of British - The Scottish Challenge! 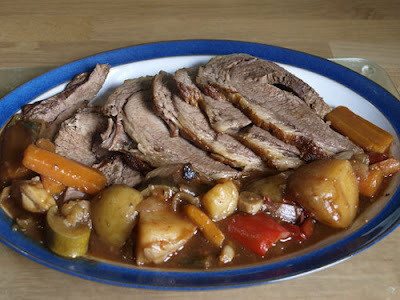 When you think about Scottish cooking what comes to mind? Haggis? Salmon? Oatcakes? Cullen Skink? 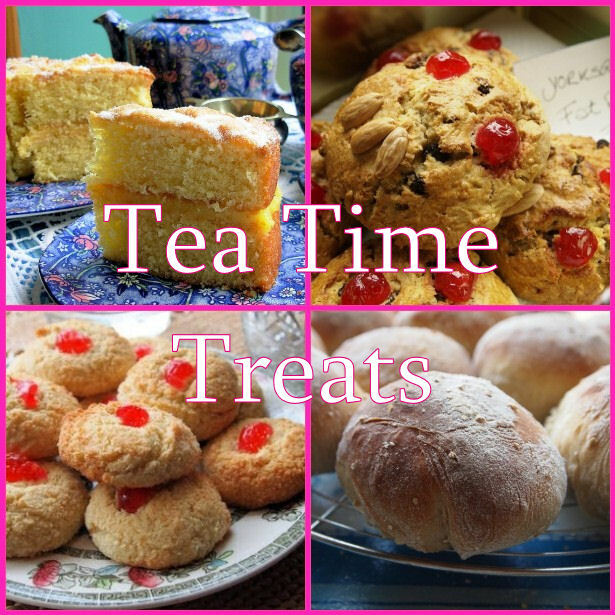 There are plenty of modern and traditional recipes to choose from in the Scottish Kitchen so why don't you rise to the challenge and cook or bake something Scottish, put it on your blog and you could be in with a chance to win. We’ll be showcasing the entries both on the Face of New World blog and on host blogs and promoting the recipes through Facebook and Twitter, with all your entries fully credited back to your blogs. So, why not show what you think is the Best of British and join our challenge. Post your recipe on your blog with a link back to The Face of New World Appliances AND to this post. Add the Best of British badge to your post. Add "Best of British" to your post or as a tag. 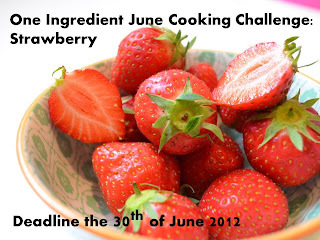 E-mail bestofbritishchallenge@gmail.com with your recipe title, a link to your post and a photograph by Midnight of 15th July. If you post on Twitter, you can use #BestofBritish and if you mention @fionamaclean or @serialcrafter or @newworldapps, we will try and retweet. The round-up of entries will be posted on or before the 20th July on The Face of New World Appliances and here on my blog too. The Best of British Challenge has been organised by Karen Burns Booth of Lavender and Lovage and Fiona McLean of London Unattached. Many thanks to them both for all their hard work and to Choclette at Chocolate Log Blog for hosting the first month featuring recipes from Cornwall. Remember to check the round up on the 20th June. There are so many fantastic food producers in Scotland. We have high quality beef and lamb and game, incredible seafood and delicious dairy produce. The varied landscape of Scotland has the right conditions to for all of these products and, despite some of the 'deep fried Mars Bar' anti-food propaganda, Scotland has an excellent reputation for good food. I thought long and hard about what I should showcase for Best of British and toyed with a smoked venison salad or maybe some traditional baking. 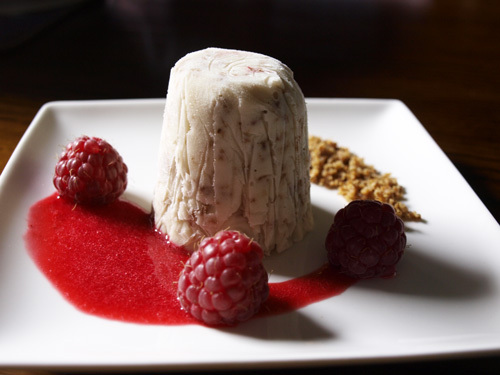 In the end I decided to put a bit of a twist on a dish that is full of Scottish products and is popular in restaurants and at home for entertaining: Cranachan. I'm not sure what that bottle says about us, there doesn't seem to be much Auchentoshan malt whisky left! 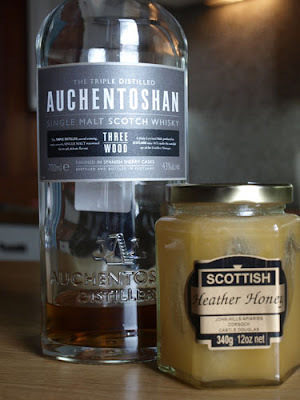 In my defence, we have had that bottle for quite a while... oh yes and some lovely Scottish Heather Honey, thick and fragrant. It's also the start of the Scottish soft fruit season. I visited a fruit farm in Fife last weekend, no raspberries there, but plenty of strawberries. 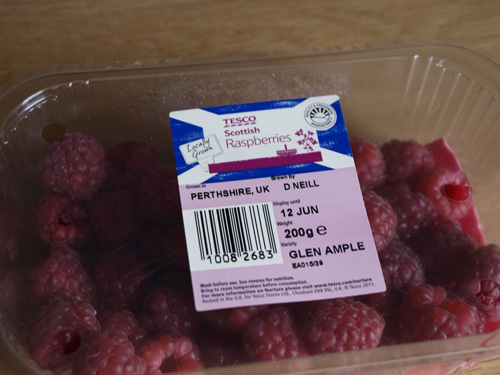 These raspberries come from Perthshire, the cooler summers in Scotland are ideal for raspberry growing. 1. Pour milk into a heavy based saucepan, add the honey and heat until almost boiling. 2. Take off the heat and let it cool slightly. 3. Whisk the egg yolks and sugar together in a bowl until thick and creamy. Gradually whisk in the hot milk, then strain back into the pan. 4. Cook over a low heat, stirring constantly, until thickened enough to coat the back of a wooden spoon. 5. Do not allow to boil! 7. Whisk the Creme Fraiche into the cold custard until evenly blended. 8. Pour into an ice cream maker and churn until frozen, alternatively freeze in a shallow container, whisking 2 or 3 times during freezing to break down the ice crystals and ensure an even-textured ice-cream. 9. When the ice-cream is still soft, add half the oat crumble and mix well. 1. Rub together the medium oatmeal and the butter until combined and resembling rough breadcrumbs. 2. Add the demerara sugar and stir through. 3. 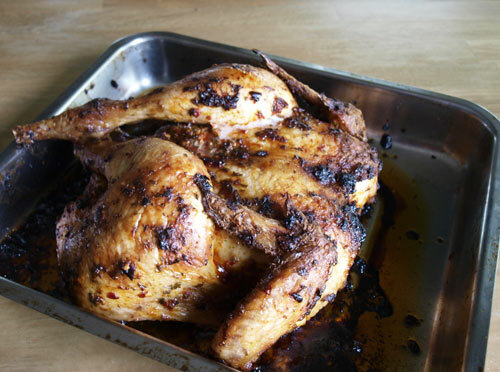 Heat the oven to 180C and spread the mixture on a baking tray. 4. 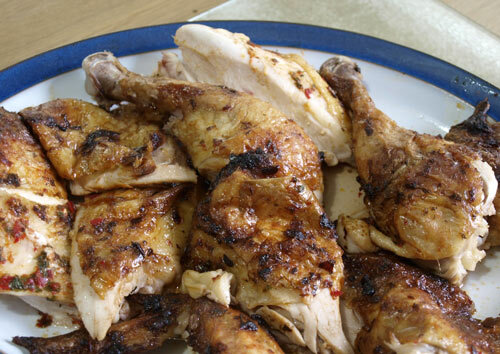 Bake for 15 - 20 minutes until golden brown and crispy. 5. Let the crumble cool. 1. 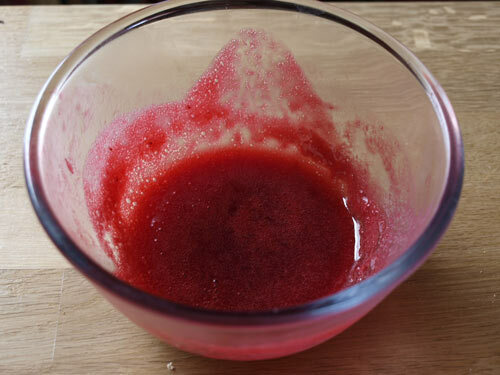 Push 100g of raspberries through a sieve, collecting the juice in a bowl. 2. Stir in the icing sugar until dissolved. 3. Chill until ready to use. 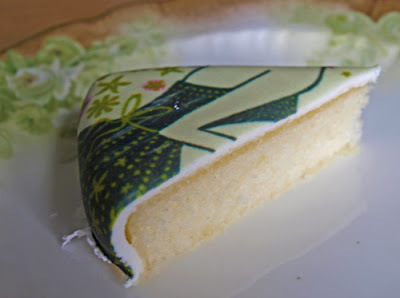 I used some old fashioned Tala Castle Cake tins, lined with clingfilm, to make my little ices, but you could use a small glass or just add a scoop of ice cream to your plate. You need to take the ice-cream out of the freezer about half an hour before eating. 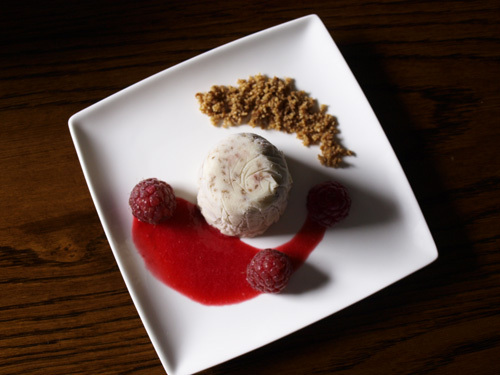 Place the ice cream on the plate, using a dessert spoon add a pool of raspberry coulis on one side and place three raspberries in the coulis. Add a little 'stream' of oat crumble on the opposite side of the plate. 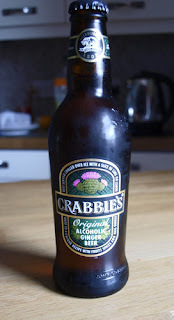 This is not an over sweet dessert, there is only a very subtle taste of whisky, but you could leave it out if you don't have it or don't like it. They honey taste is to the fore and the different textures of the crunchy oat crumble and smooth raspberry coulis are delicious with the ice-cream. I hope you will join us in the Best of British Challenge and make something from Scotland, it can be a traditional Scottish dish or a dish using Scottish produce. I look forward to seeing what you make and good luck with the prize draw.